How does Ireland celebrate New Year? The Irish are famous for throwing a party and there’s no better time to live up to this reputation than New Year’s Eve. The vast majority of us are relatively quick to brush aside the importance of New Year’s Eve celebrations. After all, it’s just like any other night, isn’t it? However, if this year your resolution is to finally make the move to Ireland that you’ve been dreaming of, just think – when New Year’s Eve 2017 rolls around, you’ll have something incredible to toast as the clock strikes midnight. So that you’ll know what to expect, let’s take a look at the Irish New Year celebrations and traditions. You’ll find many people will congregate in local pubs for great conversation, food, and live music playing into the wee hours. As New Year’s Eve falls in the dead of winter, you’ll find that most prefer to celebrate relatively close to home. That is unless they’re too young to care about the cold of course! You’ll find many will congregate in local pubs for great conversation, food, and live music playing into the wee hours. Alternatively, getting together with friends and family at each other’s homes is another popular choice, which ensures you see in the New Year with those you care for the most. Much like the UK, New Year’s Eve isn’t a national holiday, which means many will have to work, and will therefore opt to spend the run up to midnight not too far away from home. Many do opt to take annual leave around this time so that they can enjoy the festive period in its entirety, so should you wish to go elsewhere for New Year, you’ll need to book hotels and tickets in advance to ensure you find something within budget. Should you really want to get in the swing of New Year in Ireland, you might like to observe some of the country’s more old-fashioned traditions – of which there are many! Firstly, it’s customary at this time of year to conduct a thorough spring clean of your house so that you’re ready to tackle the new year in a clutter and dust free environment! It hardly seems like an activity for New Year’s Eve itself, but we can see why it might be nice to get your new Irish property all spick and span so that you can start the year afresh. Next, you might like to take some Christmas bread, and walk around your (now spotlessly clean) Irish property banging the loaf on the walls and doors of the house. In hindsight, perhaps you should perform this ritual pre-spring clean! This practice is said to chase all of the bad spirits out of your property, and invite new positive spirits in. If you’re not interested in spirits, but would quite like to welcome a new love interest into your home, you’re advised to place sprigs of holly, mistletoe and ivy under your pillow, in order to dream of your new love – this could end up being a little painful however. What’s more romantic than watching Europe’s last sunset of the year over the Atlantic Ocean? Should you be doing as many Irish folk do and enjoying an evening in with friends and family over dinner, it’s customary to honour those family members who are no longer around. In some instances, families will lay a place for them at the table, and leave the door unlatched so that they can join the festivities. New Year’s Eve is also a time for predicting what sort of year you might have ahead of you. Whilst you’re discussing your resolutions, you might find your company are keeping one eye on you, and one on the door. This is because legend has it that the first person that walks through the door will be an indicator of the year ahead. Should that person be a tall, dark and handsome chap – the home and it’s occupants will be graced with good luck for the year to come. Sadly, if it’s a red-haired girl, you’ll all be doomed to another year of hardship and grief! Another way that the Irish traditionally predicted the year ahead was to check the way that the wind was blowing. Should the winds be coming from the west, Ireland was destined to have a wonderful year. Should they be hailing from the east, all was lost and all the good luck was believed to be blown to Britain. If staying at home just doesn’t appeal, you’ll be pleased to hear there are events all around Ireland – black-tie balls, swanky dinners, late night dance clubs, the whole works. Here are just three of our suggestions for how you might choose to celebrate in 2017. If staying at home just doesn’t appeal, you’ll be pleased to hear there are events all around Ireland – black-tie balls, swanky dinners, late night dance clubs, the whole works. If you wouldn’t dream of being anywhere else but the Irish capital come New Year’s Eve, you should ensure you’re in town to capitalise on all the festivities associated with the New Year Festival Dublin. Each year, big name musical guests entertain the crowds packed in to St. Stephen’s Green. Aside from the live music, you can enjoy 3D light projections and the obligatory countdown to midnight, which is broadcast throughout the country. 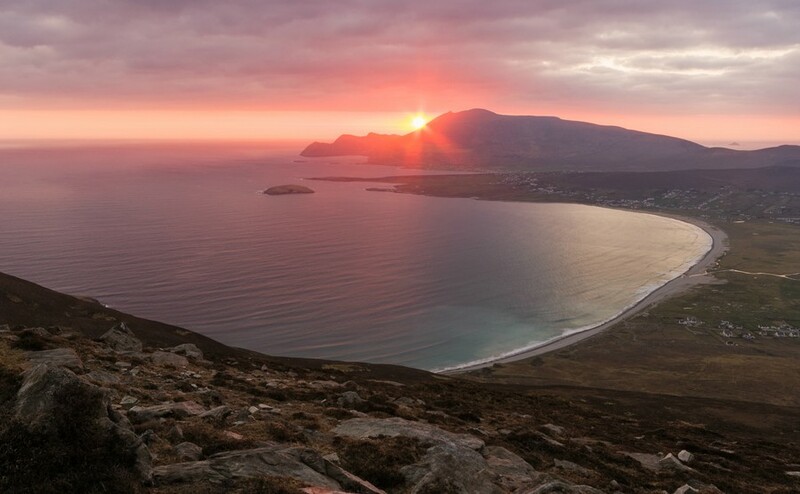 If noise and crowds just aren’t your thing, set sail for Achill Island, where you can watch the last European sunset of the year. Each year, crowd’s gather on Minuan Hill to watch the last sunset of the continent sink below the waters of the Atlantic Ocean. Once night falls there is a huge parade through the streets, and pipe bands play you in to the New Year. Should you be in need of a hangover cure first thing on New Year’s Day, it’s customary on the island to brave a quick, icy dip at Dugort Beach. If noise and crowds just aren’t your thing, set sail for Achill Island, where you can watch the last European sunset of the year. A popular choice for those seeking a different kind of New Year is to head to the small village of Portmagee in County Kerry. Each year they host their Old Year parade, which involves a street parade of pipers led by a local man dressed as the “Old Year”. Over the course of the procession, and the closer you edge to midnight, the older the Old Year gets, until eventually as the clock strikes midnight, the decrepit Old Year vanishes and is replaced by an energetic young man – the New Year! If, having heard how Ireland celebrates, you’ve decided that enough’s enough and you can’t bear to spend another New Year’s Eve in the UK, give our Resource Team a call today on 020 7898 0549 to discuss your options. 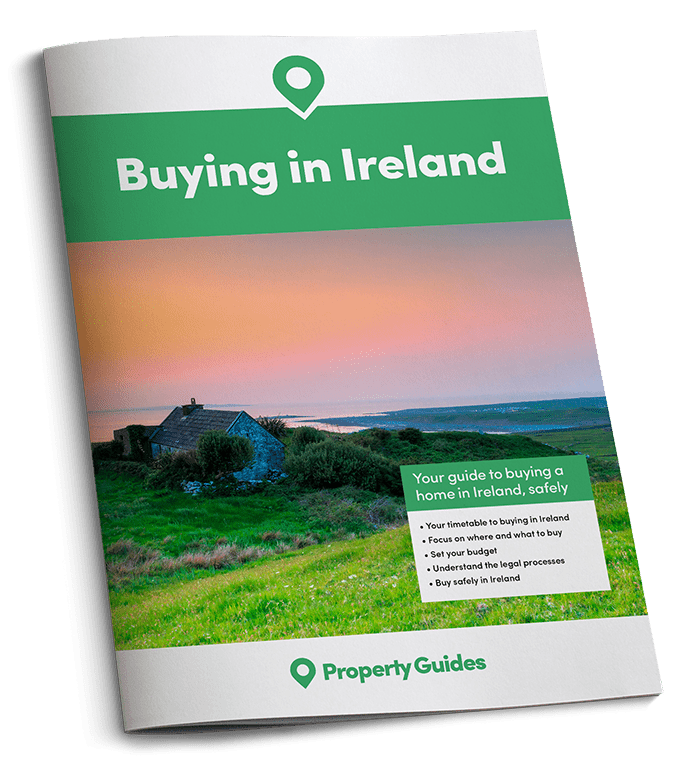 From all of us here at the Ireland Property Guide, we wish you a happy and prosperous New Year, and we look forward to helping you achieve your dreams of buying in Ireland in 2017. Happy New Year!